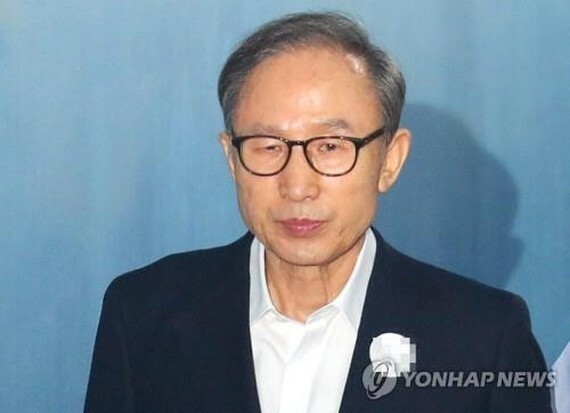 Prosecutors on Thursday requested that a Seoul court sentence former President Lee Myung-bak to 20 years in prison for corruption and other charges. The demand was delivered to the three-judge panel at the Seoul Central District Court in Lee's trial that began in early May. Prosecutors also called for a 15 billion-won (US$13.4 million) fine and a forfeiture of 11.1 billion won for the disgraced ex-leader. The court's ruling is scheduled for Oct. 5. Lee, president from 2008-2013, was indicted in April on 16 counts of corruption ranging from bribery, abuse of power and embezzlement to other irregularities. He has been under presentencing detention since his arrest in late March. Lee's charges center on long-held suspicions, which dogged him throughout most of his political career, that he is the real owner of an auto parts company named DAS and used his presidential powers to benefit the company as well as himself and his family. Part of the bribes also includes $5.85 million in lawsuit expenses Samsung Electronics Co. allegedly paid on behalf of DAS. The former Seoul mayor is also accused of taking about 11.1 billion won in bribes from the state intelligence agency and a former head of a state-run banking firm. Prosecutors suspect he embezzled about 35 billion won from DAS and used it for personal purposes. In Thursday's hearing, Lee vented anger over the charges and maintained his innocence. "I cannot stand how the charges against me have caught me in the trap of such a stereotypical image that everything is linked to money," he told the court. "It is so humiliating as a person who has lived his whole life loathing corruption and back-scratching and being so vigilant against such things." Lee again denied ownership of DAS and said he never accepted anything from a conglomerate or its chief, referring to Samsung Group Chairman Lee Kun-hee. "I do not own a single share in DAS ... and I feel saddened, beyond rage, that (they) prosecuted me for freeing Chairman Lee in exchange for the lawsuit fees," he said. "All I have is the house I live in." His lawyer accused prosecutors of carrying out a far-fetched investigation and called for a wise judgment by the court. The charges against Lee are punishable by up to life imprisonment. The scandal tainted his long-established image of a self-made man who started off as a salaryman and rose to the top post at one of the country's leading companies in only 11 years, before he entered politics in 1992. Lee has insisted this trial is political retaliation by the office of President Moon Jae-in over the death of late President Roh Moo-hyun, Lee's predecessor. Roh committed suicide in 2009 while under a prosecution investigation into a slew of corruption allegations. Lee's associates have claimed that Moon, a key Roh ally who served as Roh's chief of staff, is trying to force the same humiliation back on Lee. The 76-year-old is the fourth former president to face a criminal trial after ex-Presidents Chun Doo-hwan, Roh Tae-woo and Park Geun-hye. Park is serving a 25-year jail term for corruption, pending a top court decision.